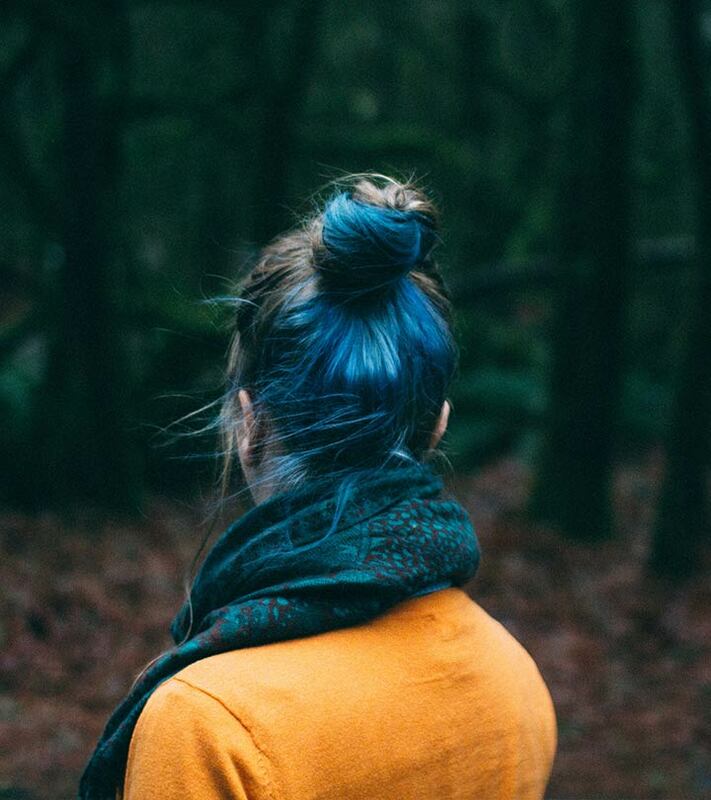 The top knot is taking the world by storm! And why not? It is a simple and easy hairstyle to achieve, which makes it perfect for work, gym, or a night out on the town. It is also perfect for those hot, hot summers when you feel like shaving all your hair off but know you’ll regret it later. 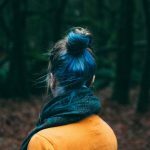 So, if you want to know how to achieve the perfect top knot, scroll down to check out 10 easy DIY tutorials. Brush down all your hair and apply some dry shampoo to it. This will give it texture and volume. Gather all your hair at the crown to create a high ponytail. Take an elastic band and pass it over the ponytail once. Twist it and pass it over your hair again, but this time, pass it only halfway through and leave the ends of your hair out. Loosen up your hair everywhere to make the hairstyle a little bit messy. You can also pancake the bun to make it flair out. Pin down any loose strands of hair to finish off the look. Start off with unwashed hair for this hairstyle as it will give your top knot some texture. Brush your hair thoroughly to remove all knots and tangles. Apply some dry shampoo to hair to give it texture and volume. Tease your hair at the crown to make it voluminous. Gather the hair at the top and front of your head. Take an elastic band and pass it over the hair once. Twist the band and pass it a little more than halfway over the hair again. 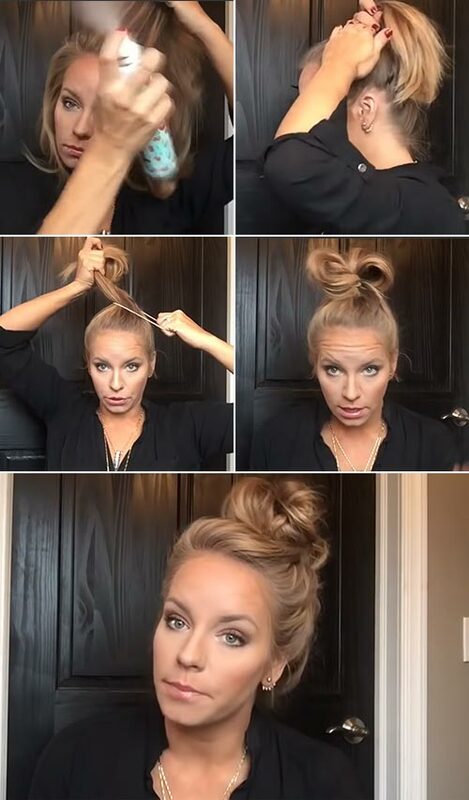 Leave only the ends of your hair out of the bun. Pancake the bun to give it a messy look. Secure the ends with bobby pins. Tie all your hair in a high ponytail. Lift the hair from the ponytail and twist it once at the base. Wrap the rest of the hair around the twist. Twist the ends of your hair and wrap them around the base of your bun. Secure the bun with another elastic band. Gather all your hair in a ponytail and smooth out any bumps with your hair brush. Take an elastic band and pass it through your hair once. Twist the band, but this time, don’t pass all your hair through. Pass only half of your hair through it. This will form a fan bun. Stretch the fan bun and wrap the ends of the ponytail around its base. Secure it with bobby pins. Loosen up the bun to give it a slightly messy look. Pin down the ends of the fan bun to the sides as well to give it a fuller look. Apply some dry shampoo to give your unwashed hair some texture and hold. Flip your hair over and run your fingers through it to make sure there are no knots. Gather all your hair in a ponytail at the crown. Twist it at the base once, then wrap your hair around the twisted hair. Tuck all the loose hair within the bun and tie it with an elastic band. Gather all your hair and tie it in a high ponytail. Tease the hair in the ponytail to make it more voluminous. Twist the ponytail and wrap it around to make a bun. Use the second hair tie to secure the bun in place. Gather all your hair in a high ponytail and secure it with an elastic band. Spritz hairspray on the top and bottom sections of the ponytail to smoothen them out. Tie another elastic band a few inches below the first elastic band. Pancake the hair between the elastic bands to make it wider. Loosen up the hair above the first elastic band and pass the hair from the ponytail through it. Don’t pass the hair completely through, though. Stop at the second elastic band. Spread the hair within the elastic bands more to create a bubble bun. Wrap the ends of the bun around the base of the ponytail and secure them with bobby pins. Detangle and brush all your hair back. Apply some mousse to the front and under-sections parts of your hair. This will give your hair a slick, pulled-back look. Gather all your hair and tie it in a high ponytail. The key here is to get your hair as high as possible. Secure it with an elastic band. Spritz on some hairspray to slick back any strays and keep your hair in place. You can keep going back and forth with your brush and hairspray to make sure your hair is slicked back perfectly. Divide the hair in the ponytail into two sections and twist one section of hair. Wrap the twisted section of hair around the base of the ponytail. Secure the ends with bobby pins. Twist the other section of hair and wrap it around the first twisted section. Secure it in place with bobby pins. This top knot looks great when done with unwashed hair. So, try it on two-day-old hair. Using the round brush, gather all of your hair at the crown and tie it in a high ponytail. Spritz some hairspray on the top and sides of your hair. Tease the ponytail to give it more volume. Weave the hair in the ponytail into a regular three-strand braid. Wrap the braid around the base of the ponytail to create a bun. Secure the ‘do in place with bobby pins. Apply some dry shampoo to your unwashed hair to give it body. Apply some to your roots as well to fluff up your locks. Flip your hair over and scrunch it from the ends to the roots to give it more volume. Flip your hair over one more time and gather it in a ponytail at the crown. This will help you tie a really high ponytail. Smoothen out any strays and bumps of hair. Take the elastic band and pass it over the ponytail once. Twist it and pass it over your hair again, but this time pass your hair only halfway through. This will create a bubble bun. 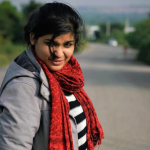 Loosen up your hair all around to make the hairstyle loose and messy. You can also pancake the bun to make it flare out a bit. Wrap the rest of your hair around the base of the bun and pin it underneath. 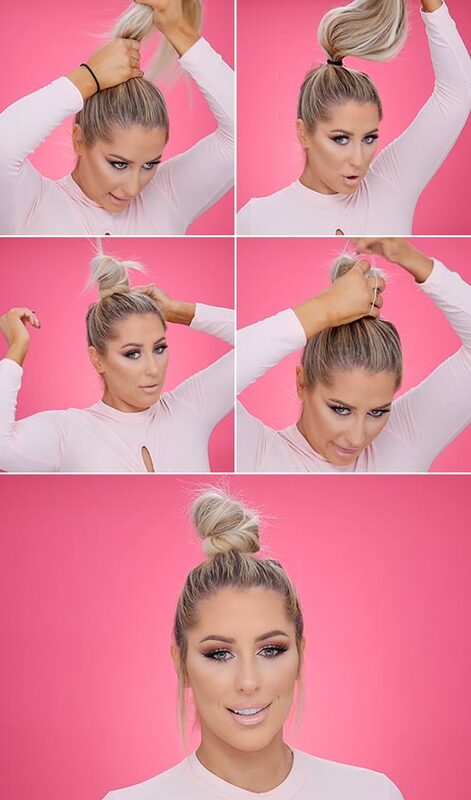 Hope these top knot tutorials help you tie the perfect top knot. Which one of these chic top knots are you dying to try out? Let us know in the comments section below!